Video is another way brands can building engaging content and storytelling – and also break through the clutter. Sarah Quinn joined our recent #CMWorld Twitter Chat to share ideas on how to create video solutions for your content marketing program. For more resources on video, take a look at our video templates or tips on building your own visual storytelling. Join us each week at noonEastern for our Twitter Chats. A1 #CMWorld I’ve only used videos sparingly as I’m a better writer in general, but as video is catchier to the eye, I’m doing more. @CMIContent Thanks! Can’t wait to learn some great info on this #cmworld chat! A2 #CMWorld Depends on your medium. I won’t watch something longer than 15 secs on Twitter, but I’ll go a full minute on Facebook. A3 #CMWorld Not taking full advantage of built in CTAs in YouTube and Facebook. Hey #cmworld! Sorry to miss so much. Looks like we’re talking about video today! Arrggh it’s Tuesday which means #cmworld. WhadImiss? A4 #CMWorld I write it down myself for longer videos than say 10 sec. I should work on storyboard but just haven’t had opportunity yet. 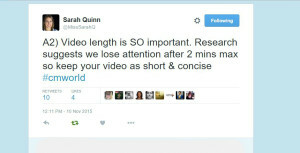 “@MissSarahQ: A3) Think of your video like a movie trailer – tease your audience so they want to find out more about your brand. Late to the #CMWorld party. Hope to jump right in on the discussions. Have I caught up yet? #cmworld – No. @MissSarahQ Love your feedback in the #CMWorld chat! #CMworld @CMIContent There’s always a great reason. Just to show you exist is one. Trying to educate a cause is a better one. @CMIContent Every brand has its own story, and the story should also be depicted in the platform of its campaign. #CMWorld . Sidebar, this conversation reminds me of discovery during #CMWorld in Sept. that @Letterman archives had been expunged from @YouTube. Sigh.
.@CMIContent Thanks for the awesome #CMworld #Chat regarding #video #content! Inspired by @MissSarahQ, host, and guests to make more video!